HAWTHORNE, CA--(Marketwired - May 8, 2014) - Stylish new home designs that offer everything today's buyers are seeking don't tend to stay around for long and that is certainly true of The Flats at gated ThreeSixty by William Lyon Homes, where the final residences are now selling. Anyone who has been waiting for the perfect time to buy one of these chic residences featuring convenient and comfortable single-level living in this top-selling South Bay community should hurry in. There are only a handful of homes remaining and hesitating could mean missing out on an exceptional new home opportunity. Homebuyers who have not yet registered their interest can do so immediately at www.lyonhomes.com/the-flats. The few remaining homes for purchase at The Flats include: the 957-square-foot Plan 1 studio; the 1,429-square-foot, 2-bedroom 2-bath Plan 3; the 1,654-square-foot, 2-bedroom, 2-bath Plan 5; the 1,662-square-foot, 2-bedroom + retreat, 2-bath Plan 6; and the 1,548-square-foot, 2-bedroom, 2-bath Plan 8. All have been planned to maximize livability with modern designs, open living space and in-demand features like chef's kitchens with islands, spacious bedrooms, ample storage, 1 and 2-car garages and outdoor deck space. Additionally, select residences offer 30-day move-ins for those who absolutely can't wait one minute longer to live at The Flats. Some of these quick move-in homes have hardwood floors, an array of upgrades and are located close to the community's resort-style amenities. "We all know the saying: 'Run, don't walk,' and that certainly applies to the last few homes at The Flats," said Lesley Pennington, Vice President of Sales for William Lyon Homes. "Few opportunities remain and buyers who want a great combination of stylish home designs, ease of living, and South Bay convenience should act quickly. Those who have yet to capture a piece of The Flats for themselves should hurry in to experience the lifestyle and the location for themselves. We wouldn't want anyone to miss out on the chance to live here." At The Flats, being in the center of it all never looked so desirable. Its central location in the award-winning community of ThreeSixty puts residents within minutes from the beach, major employment centers, downtown LA, and even LAX. 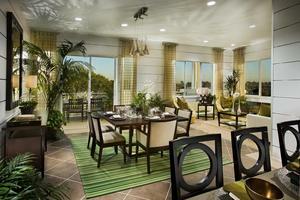 Gated ThreeSixty is the South Bay's best-selling community and home to 300+ homeowners. Discover The Flats by taking a tour of the individual model homes or log onto www.360southbay.com and Like ThreeSixty on Facebook. Enjoy an active, social lifestyle at The Center, the community's private recreation facility. Amenities include a resort-style swimming pool, four-lane lap pool, spa and cabanas enveloped by beautiful palm trees, as well as basketball, paddle tennis and bocce ball courts. There is also a billiards lounge and bar, wine room, outdoor entertainment area with barbeques and fireplace, state-of-the-art gym, and multi-purpose room. To visit The Flats at ThreeSixty when traveling southbound on the I-405 from the north, exit at El Segundo Blvd., turn left on La Cienega, right at El Segundo Blvd. and left at Isis into the community. Traveling northbound on the I-405 from the south, exit at El Segundo Blvd., turn left on El Segundo and left again at Isis. The Sales Gallery is open daily from 10 a.m. to 6 p.m. For more information, please call 310.727.0762.